Before I start this article, I would recommend you have a look at the Part 1 to this where I explain how contingency plans, cash flow forecasts and USPs can benefit your PPC campaign. Looking back on the first part, we established that pay per click advertising can be compared very closely to that of a business with a strong focus on the marketing and advertising sector. Therefore, we can compare some of the aspects of a business to that of PPC. In doing so, advertisers will be able to improve their campaign. When a business is first created, 99.9% of business owners will produce a business plan outlying what their business is about, their corporate objectives and details about the four sectors of the business being finance, HR, marketing and operations. Relating this to PPC, it is recommend that advertisers make a PPC Plan for their campaign outlying their corporate objectives and what they aim to do to achieve these objectives. Putting PPC, aside, starting anything up from scratch is a tough job. Therefore, linking back into PPC, you want to make it as easy and successful as possible when starting up and creating a PPC campaign for the first time. Google Adwords does a great job enabling advertisers to create campaigns in under five minutes. But, this won’t make your campaign successful. A PPC Plan will. For those that have large budget PPC campaigns, it is likely the control of the advertising campaign is shared between people to make the large scale campaign more manageable. In these cases, communication is everything. A business can literally crumble to failure if communication between employees is lost. This makes clear that for those that have PPC campaigns shared between others, always communicate as frequently as possible. For example, if there is a problem with the campaign that person 1 has found, the quicker he communicates that problem to person 2, the quicker the problem is to being sold reducing the deficit of the problem. A business, be it on a weekly basis or monthly, we always review their progress. A meeting will usually occur explaining what has been achieved, what hasn’t been achieved and how the business can improve on that. In simple terms, it is ‘learn from your mistakes’. In PPC, you can do exactly the same. Every month or week, review the performance of your campaign linking it into your corporate objectives in your PPC Plan. From this, you will be able to identify where your campaign has done well and bad making sure you are not to make that same mistake again. The more you learn about your campaign, the less chance it has of failing. Like with a business too, your PPC campaign will be affected by external factors which you need to be aware of. For example, businesses are finding extremely difficult to stay afloat in an economy where we are in a recession. Remember that this will in turn have an effect to people’s spending habits, how they act on the internet and therefore your PPC campaign. 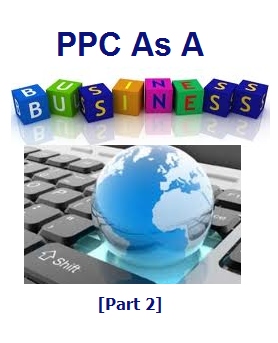 Share your comment 2 responsesTO Think Of PPC As Business [Part 2]. This completes PART 1. Very good pointers Will. Communication and Review your Performance are basics of a business and applying it PPC is just a brilliant idea! It does make you realize how close PPC is to being a business! All the elements of PPC are ultimately within a business too.